Water, Cocos Nucifera (Coconut) Water*+ , Aloe Barbadensis Leaf Juice+*, Macadamia Ternifolia Seed Oil*, Cetearyl Alcohol*, Cetearyl Olivate*, Glycerin*, Butyrospermum Parkii (Shea) Butter*+, Crambe Abyssinica Seed Oil Phytosterol esters*, Sorbitan Olivate*, Sorbitol*#, Niacinamide (Vit B3), Palmitoyl Camellia Sinensis Extract (Green Tea)*, Cocos Nucifera (Coconut) Fruit Juice*+, Tocopheryl Acetate (Vit.E)*, Olea Europaea (Olive) Fruit Oil*, Behenyl Alcohol*, Hydrogenated Olive Oil*, Sorbitan Caprylate*, Sodium Gluconate*#, Xanthan Gum*, Ethylhexylglycerin, Arginine, Olea Europaea (Olive) Oil Unsaponifiables*, Rosmarinus Officinalis (Rosemary) Leaf Extract*+, Tocopherol, Helianthus Annuus (Sunflower) Seed Oil*, Lecithin*, Fragrance*, Propanediol, Potassium Sorbate, Sodium Benzoate, Benzoic Acid, Limonene^, Linalool^, Citronellol^, Citral^. 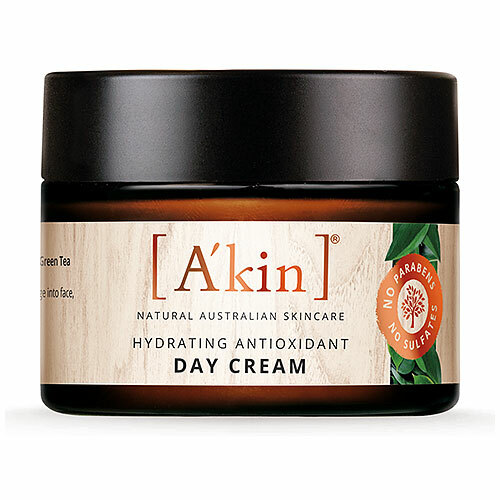 Below are reviews of A kin Hydrating Antioxidant Day Cream - 50ml by bodykind customers. If you have tried this product we'd love to hear what you think so please leave a review. Nice, light lotion. Lovely natural ingredients. I don't think it'd be great for very dry skin due to its light texture but a very pleasant lotion with a subtle aroma. I like it. Lovely brand. I recommend. This is a very light feeling, almost liquid cream, and spreads easily and quickly. I love the sensation. Perfect for the 'running out the door' mornings. However, there is a feeling of moisturised skin for many hours, soft, supple, and with no tightness. Would suit women from young to middle-age+. A'kin brand is a great discovery.